I Drink, Therefore I Am. Achievement unlocked – Survived NZ Beer Festival 2012. Just. Having failed to follow my own advice… and wishing I’d noticed the free water stands earlier in the day! What a great venue the Cloud proved to be for this event. Everyone together in one space, big enough but not too big for the sell-out crowd. I don’t think you could have asked for more. There were still the usual wimps, sticking with their Carlsberg or whatever, but we managed to steer a few of them towards Epic Armageddon or a Brewery Britomart Customs 69. I am sure minds were blown. And the nice security lady I spoke to said that there had really been very little trouble at all. Which is great to hear. You see, we Aucklanders CAN have a successful beer event. Sure it’s no Beervana, but a good event nonetheless. Everyone I ran into seemed to be enjoying themselves, and surely that is “the main thing”. But now it’s the day after the night before. And it’s looking pretty sombre (not just the Auckland weather). At least drinking proper craft beer, there is none of that steinbomb thumping headache stuff going on (you know what I’m talking about), but I’m still feeling a bit the worse for wear. How to get ship-shape to face the day? Like all adventures, coming out the other side of a hangover requires preparation. The best cure of all is to not drink to excess in the first place, however as we all know, it’s too easy for “one quiet” to turn into something quite different, if you and your mates are of a certain persuasion, and there are just so many delicious craft beers to try. Hell, they ain’t gonna drink themselves, right?? Well, here’s my “Never-Fail” tips for superior hangover management. Before heading out, make sure you have a big glass of water within reach of your sleeping place. If it’s going to be a big one, some panadol might not hurt either. Take a good multivitamin before you go out. Alcohol, or more, your body’s way of processing alcohol, tends to strip you of precious antioxidants and minerals (although beer does contain a good dose of them as well), so you had better have some spares floating around. That, and it makes your pee flouro green! Which is always kind of cool I think. You climb out of the cab and mutter something resembling “thanks” at the driver. Things are a bit hazy. Use the bathroom. Find your way to bed and lie down. Reach out for that glass and take a good sip. Dehydration is the main cause for a hangover, so get the jump on it. Unless you’ve managed to drink yourself into a coma, you’ll probably wake up a few times. Each time you wake up, reach for that water again. Just a sip each time is fine. The more water you can get down before the booze wears off, the better. As well as helping with dehydration, it will help your liver to process the alcohol. At this stage, your liver needs all the help it can get. If you can stomach some food, get an early breakfast into you once you can drag yourself out of bed. And if you can’t, try anyway. The food helps to settle things down and gives your stomach something to process so that it’s not churning away empty and producing bile, which tends to make one sick, and there is some evidence it helps with hydration, too. Bacon butties have been scientifically proven* to be a superior hangover breakfast, or scrambled eggs, but if you are not one who dines on the swine, and you couldn’t stomach cooking an egg, toast will work too. *not really, but it does work wonders. Trust me on this one. Once you’ve eaten something, pop another multivitamin. All that diuresis (increased urine production) will have depleted your body of pretty much anything good. If you’ve been sick, all the more so. Get that good stuff back into you. Still feel like throwing up? If the nausea is really getting to you, go and get it out of your system, but if you can, fight it, it will pass, besides – throwing up this late in the game is not really going to help you. If you do, brush your teeth to get rid of the stomach acid, and make sure you try and drink more water, and eat again as soon as you can. Now just like politics, beer, and religion – I’m sure everyone has an opinion on this one… So what’s your never-fail hangover cure? Oh yeah, and what’d you think of the Beer Festival!? Welcome, intrepid visitor, to the home of the Hopful Thinkers. Who are the Hopful Thinkers? We are a motley assortment of “Craft Beer Enthusiasts” – and good mates. We get together every Wednesday, and drink, and discuss, and think about Beer. And whatever else comes to mind. We blog about beer, brewing, breweries, brewers, and other related beer-type subjects and we are “all up in that social media” – whatever the hell that means. We’ll be putting up some bits here and on twitter… to help you find the best stuff at the Beer Festival as we do. DO NOT MISS the Brewery Britomart, they are new in town and have some sensational beers, and can be found at stall zero. We reckon they will sell out for sure so get there early. Safety first – try to avoid having too much of anything with “Imperial” “Double” “Tripel” or “Quadrupel” in the title too early in the day… these are synonyms for “rocket fuel”. There are two major reasons for this – one, you’ll peak too soon – we don’t want to be stepping over bodies and puddles of vomit – and more importantly, you will barely taste anything else afterwards. Pace yourself!! Most importantly though, seek out beers you haven’t tried, or maybe even heard of before, and give them a shot. You never know, you might leave with a new favourite. Wishing you an enjoyable and safe day at the NZ Beer Festival — and hope to see you around! Nestled in the natural beauty that is the Coromandel Peninsula, just a few short hours drive from Auckland, there is a brewery known simply as the Coromandel Brewing Company. Neil Vowles has been brewing beer since his student days. In the 80’s good beer in the UK was hard to come by; this combined with a student budget made brewing his own an attractive option. His passion for brewing carried on as a hobby until moving to the Coromandel in 2008, and finding a lack of craft beers in the area. The solution was obvious – start a small brewery and fill the void! Sweet toffee on the nose, turning to a malty, bitter toffee on the palate. The Golden Tusk Special comes across as a traditional british ale in similar style to Old Speckled Hen and it’s ilk. Despite the 7% heft, the alcohol is barely detectable and this is supremely easy to enjoy. Recommended session beer, at least, if you’re in the mood for a big night! Tigers. Balls of Twine. Pyramids. Waimea Bay Waves, Ohakune Carrots. Some things are meant to be big. Not least the Imperial Pilsener we’ve all been waiting for. Well, at least we have been here at the Hopful Thinkers. The beer we are talking about is of course, Epic Larger. 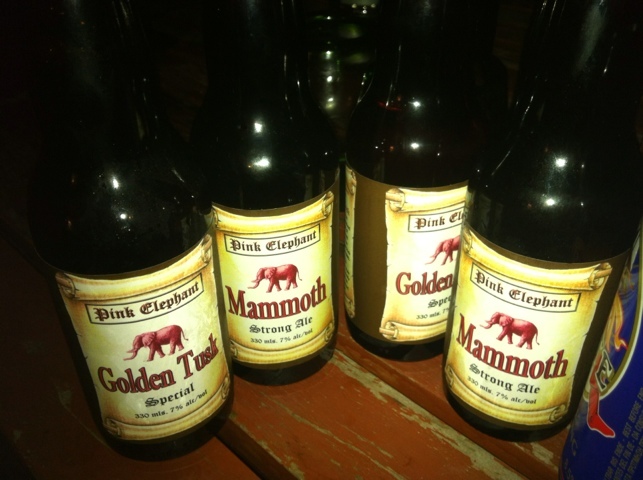 We were fortunate enough to score a couple from the lads at Epic for a wee taster. Far be it from us to refuse. So here we go. Light in colour; white head dissipates to a lasting lace, nose reveals a fruity bouquet, smooth and wet mouthfeel, stalky red grapes, sherbety tang and a shitload of potential… The slightly bitter finish rounds it out nicely. If you’d not read the bottle, you would have no clue it was hiding 8.5% of alcohol, I must say Larger sure goes down easy. This is an absolutely superb example of a Pilsener. I can’t wait until it’s had a couple of weeks to open up and reveal its true colours, it’s damn good already!